These movies are almost always overkill on evolution BUT Nigel's enthusiasm for "critters" and the pure joy to learn about them is great! He does downplay the violence a bit although there is alot of excitement (as he is chased by a carnivore following his jeep or the ocean predators usually consider him "lunch") We rememind ourselves these "monsters" are only robots after all! The thing I love about Nigel is the fact that he goes out of the way to make it easy to understand the sheer size and what it might have been like to live in those times for example, Nigel flies in an ultra-light next to a pterydactyl flock to give one the sense of size then comes upon the Quetzalcoatlus northropi. As a homeschooling mom, I am always looking for ways to connect my kids more deeply to their subjects and I could see this film accomplishes just that. Nigel Marvin has done it! In his first series of 'travel back in time to see dinosaurs first hand' adventures, "Chased by Dinosaurs" is an interesting and clever portrayal of how dinosaurs might have lived and includes a look at some lesser recognized species. Our family are big fans of his more modern series broadcast on Animal Planet, "Prehistoric Park" and we cannot wait to have those episodes on DVD as well. Imagine the late Steve Irwin traveling back in time to mingle with T-Rex et al, and you will have an idea of what "Chased By Dinosaurs" is all about. Highly recommended. Join Nigel Marven on yet another wild adventure as he travels back in time to learn about dinosaurs and other monstrous prehistoric creatures! Very engaging and entertaining, not entirely accurate anymore, but holds up very well for its age. High Marks for "Chased by Dinosaurs!" Chased by Dinosaurs is an incredible nature series that follows Nigel Marven as he travels back in time to the various ages of the dinosaurs. The special effects in this series are sensational, making you feel as though Marven is actually co-inhabiting the same deserts and forests that the monstrous dinosaurs are shown plodding through. Marven shines as the host, going above and beyond in his attempt to convince the viewer that his life is quite often in mortal danger. The gem of this collection is the segment entitled "Sea Monsters," in which Marven travels back to the seven deadliest seas of all time. Beginning in the least deadly of the seven seas, still one which contains giant sea scorpions, Marven gradually enters ever more dangerous waters until he comes face to face with such creatures as the giant ancestor to the Greak White Shark, Megalodon, as well as the enormous Liopleurodon. This element of ever-increasing danger is one of the many ways in which this program is so entertaining and gripping. Each time Marven enters the water the stakes are higher and he faces greater and greater dangers. 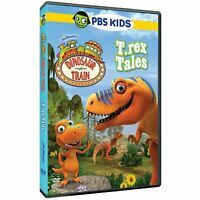 I bought this DVD because I love nature programs, particularly ones relating to dinosaurs. There is truthfully nothing about this DVD that I dislike - it is brilliant from beginning to end.